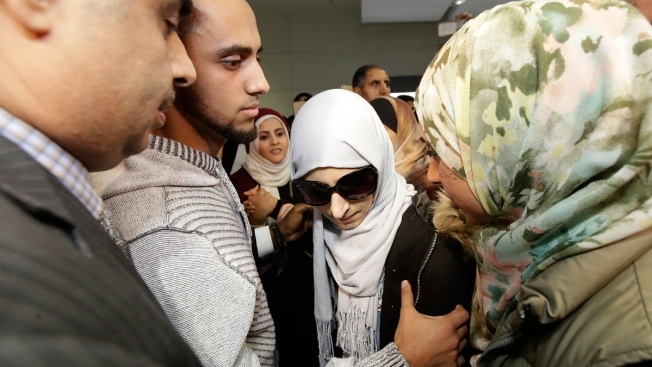 Shaima Swileh, center, stands with her husband Ali Hassan, second from left, after Swileh arrived at San Francisco International Airport in San Francisco, Wednesday, Dec. 19, 2018. Swileh is the Yemeni mother who won her fight for a waiver from the Trump administration's travel ban that would allow her to go to California to see her dying 2-year-old son. A terminally ill boy whose Yemeni mother fought to visit him after being barred from entering the U.S. by the Trump administration's travel ban has died in hospital in California, NBC News reported. Abdullah Hassan, 2, had suffered from a genetic brain condition and died at the UCSF Benioff Children’s Hospital in Oakland, the Council on American-Islamic Relations (CAIR) said in a statement released Friday. “We are heartbroken. We had to say goodbye to our baby, the light of our lives,” Abdullah’s father, Ali Hassan, said in the statement. Hassan — who is a U.S. citizen and has family in Stockton, California — brought his son to the U.S. for treatment a few months ago, CAIR said. But Abdullah’s mother, Shaima Swileh, is a Yemeni national and was barred from entering the country under the Trump administration's travel ban against people from mostly-Muslim-majority countries. CAIR launched a campaign to publicize the family’s plight earlier this month and on Dec. 18 the State Department granted Swileh a waiver to visit her dying son. The 21-year-old mother arrived in San Francisco on Dec. 19.